Iceland's Singapore Sling came to the attention of many with a fuzzed-out, buzzed-out array of swirling rock guitars that brought to mind the Jesus and Mary Chain, My Bloody Valentine, and other groups of the precious but infectious ilk. The sea of guitars is what piqued my interest in them with their smash debut The Curse of Singapore Sling, along with the reviews that compared them to those aforementioned bands. This album seems to take a step back, though, and it isn't as powerful as the first go-around. Nonetheless, the group's leader Henrik Bjornsson is intent on creating a soundtrack for future prequels to either Pulp Fiction or Reservoir Dogs. Beginning this dozen-ditty album is "Sunday Club" with a plodding and extremely deliberate backbeat. From here the guitars sound as if they're tuning a bobcat to quote the line from Spinal Tap. With a blend of the Doors' trippy psychedelic rock and the early moments of shoegazer rock, it lures you in and keeps you hooked. From here they nail "Curse Curse Curse" with more of a hallucinatory haze than should be legal. Coming off like a distant cousin of Yo La Tengo's cover of "Little Honda", the song has all the brawn of a loud rocker but is also knee deep in a swirling, twirling melody. Bassist Thorgeir Gudmundsson and drummer Hellgi Orn Petursson lend some much-needed assistance to drive the song home. Bjornsson opens up with some fine guitar work that recalls briefly Hendrix and his experience. Yet although it's only five minutes into the album, that intangible that made the first album so infectious isn't quite as strong or pronounced. This is exemplified perfectly on the dark and sonically damp "Rockit" that talks about cats on a dead-end street. Repeating the title over and over only goes so far also, resulting in a tune that sounds unfortunately like filler at best. Just when you think the album is getting stale, they seem to up the ante with a light and dreamy, fuzz-saturated "Nightlife" that resembles a cross between Echo and the Bunnymen and Neil Young. The guitar solo only accents the song and builds after the middle eight. The true highlight though is the title track "Life Is Killing My Rock 'N' Roll", a song you have to initially put back to the beginning, crank the speakers and go just a tad nutty to. The guitars are buried in the opening verse but somebody unlocked the case and they are front and centre for the rest of it. Like a plane stopping after taxiing down the runway, the wall of noise hits you dead on two minutes in, and from there the real fun begins. "J.D." which might be a reference to a certain brand of alcohol, is stuck in the same mire as earlier tunes though, relying too often on the trippy "Wow, man" reaction. The record is a hit-and-miss, despite the hook-fuelled "Living Dead" that has been done a dozen times before but never grows tired. "My skin is grey and my eyes are red / My body's weak and I'm sick in the head," Bjornsson sings as if he's been lobotomized. The guitar riffs are at the heart of the song though -- beefy, thick and oh so lovely. Think Urge Overkill or Edwyn Collins and you get the gist of where Singapore Sling is coming from. "Sugar" continues this thankfully and doesn't get back into the sonic sludge of some tunes. Here Singapore Sling seems to channel the '50s instrumental "Red River Rock" and update it in spots. 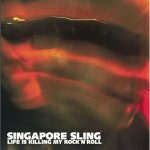 The homestretch is just as pleasing with ear candy gems such as "Guiding Light" creating the impression Singapore Sling have finally seen the light, albeit a bit late for it to be a truly great album.